Bombers killed in failed attack on IDPs camp – Royal Times of Nigeria. The Police in Borno on Monday said two Boko Haram suicide bombers were killed in a failed attempt to attack displaced persons camps and University of Maiduguri. A statement signed by Mr. Victor Isuku, the Police Public Relations Officer (PPRO), said the suicide bombers were killed by security operatives before they hit their targets. “On Sunday at about 2115hrs, a suspected female Boko Haram terrorist, took advantage of the darkness of night and attempted to gain access into Dalori 2 IDPs camp through the rear perimeter fence. “Fortunately, she was sighted by vigilant security personnel on duty and chased. “In an attempt to escape arrest, she hurriedly detonated the IED strapped to her body, killing herself alone. “The impact of the explosion destroyed a portion of the IDP camp fence. “In the early hours of today (Monday) at about 0400hrs, a male suicide bomber attempted to gain entry into the premises of University of Maiduguri. “On sighting the presence of security personnel deployed to the University on duty, he hurriedly detonated his IED, killing himself alone near the BOT building,” Isuku said in the statement. 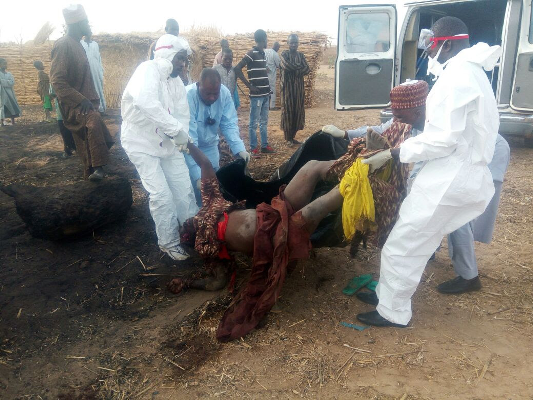 The National Emergency Management Agency (NEMA), had earlier confirmed that two suicide bombers attacked Dalori 1 and 2 IDPs camps in Maiduguri. In a statement issued to newsmen, the agency said four displaced persons were killed and 15 others wounded in the attack. It said that a male suicide bomber infiltrated into Dalori 1 camp and detonated the explosive strapped to his body and killed four persons. “Two persons died on the spot while two others died at the hospital,” it said, adding that 15 others sustained injuries in the attack. The statement added that a female suicide bomber was shot by security men when she attempted to cross the perimeter fence at Dalori 2 camp. “A female suicide bomber was spotted by security agents while trying to cross the fence. “They shot her and the explosive device strapped to her body detonated, and blew the woman into pieces,” the statement said. It said that another female suicide bomber was intercepted and killed by vigilance group at Gate 3, University of Maiduguri. said the woman detonated the explosive when she was stopped by their men on duty at about 7:45 AM. He said that the woman killed herself and one member of the vigilance group sustained injuries in the attack. The injured victims were referred to Special Hospital, Maiduguri for treatment.